I was commissioned to cover a press and publicity event by a PR company based in Lancashire. Their client; Kepak Convenience Foods, was running a nationwide sampling campaign where Italian style gondoliers handed out samples of their products in 5 cities across the UK and Ireland. 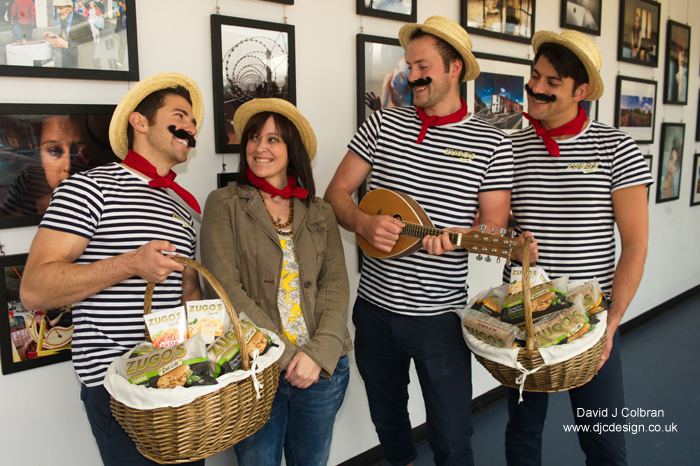 As part of this, they ran a competition on Facebook, giving one lucky winner a chance to have the gondoliers visit their office with samples of their Zugo's Deli Café panini and pasta pots for their team. The winner worked in a local college and we had great fun setting up shots indoors and outdoors and even persuaded a few students to help us out. Faizel at the agency said "Thanks David, the shots are great"